CHAT is based on concepts from the book Becoming a Healthy Church (Stephen A. Macchia, Baker Books, 1999) available at our online bookstore. "A wonderful book that I recommend to every church." 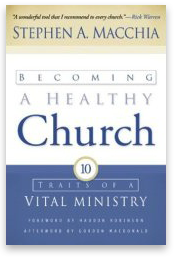 In the 10 minute video below, author Steve Macchia talks through the 10 Traits of a Healthy Church paradigm. The healthy church actively seeks the Holy Spirit's direction and empowerment for its shared life and ministry. Romans 8:16, "The Spirit himself testifies with our spirit that we are God's children." The healthy church gathers regularly as the local expression of the Body of Christ to worship God in ways that engage the heart, mind, soul, and strength of the people. John 4:23, "Yet a time is coming and has now come when the true worshipers will worship the Father in spirit and truth, for they are the kind of worshipers the Father seeks." The healthy church provides training, models, and resources for members of all ages to develop their daily spiritual disciplines. James 3:17, "But the wisdom that comes from heaven if first of all pure, then peace loving, considerate, submissive, full of mercy and good fruit, impartial and sincere." The healthy church encourages believers to grow in their walk with God and with one another in the context of a safe, affirming environment. Romans 14:19, "Let us therefore make every effort to do what leads to peace and to mutual edification." The healthy church is intentional in its efforts to build loving, caring relationships within families, between members and within the community we serve. I John 3:16, "This is how we know what love is: Jesus Christ laid down his life for us. And we ought to lay down our lives for our brothers." The healthy church identifies and develops individuals whom God has called and given the gift of leadership and challenges them to be servant-leaders. Ephesians 4:16, "From Him (Christ) the whole body, joined and held together by every supporting ligament, grows and builds itself up in love, as each part does its work." 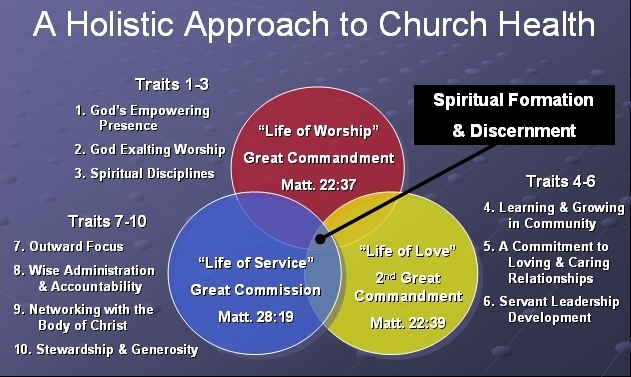 The healthy church places high priority on communicating the truth of Jesus and demonstrating the love of Jesus to those outside the faith. Luke 19:10, "For the Son of Man came to seek and to save what was lost." The healthy church utilizes appropriate facilities, equipment, and systems to provide maximum support for the growth and development of its ministries. Luke 16:11, "So if you have not been trustworthy in handling worldly wealth, who will trust you with true riches?" The healthy church reaches out to others in the Body of Christ for collaboration, resource sharing, learning opportunities, and united celebrations of worship. John 17:23, "May they (the church) be brought to complete unity to let the world know that you sent me and have loved them even as you have loved me." The healthy church teaches its members that they are stewards of their God-given resources and challenges them to be sacrificially generous in sharing with others. 2 Corinthians 9:6, "Remember this: whoever sows sparingly will also reap sparingly, and whoever sows generously will also reap generously." How Do These Ten Traits Fit Together? For more information, download our Free Guide to Church Assessment. Website Created By Leadership Transformations, Inc.